This is the fourth in a series that has as its main object "enhancing awareness of the importance of even very small differences." (Last post was Beyond Umami: the way we are"). The focusing lens for the series is a small group of fairly common spices in the parsley or Apiaceae family. Understanding how important minute differences often make in simple systems can function as a benchmark for understanding both complex systems and remote (unfamiliar) ones. Better understanding is the basis for the kind of fundamental changes that will make a critical difference in the beauty of our future lives. A quick win/win quiz to start the post-day--just for fun, but with a point for this post. In both columns, all species belong to the same evolutionary family except one. Pick the one that doesn't belong in the family. Remember that most choices can be rewarding, because humans are rewarded by Evolution with the experience of pleasure pretty much just for trying. Pleasure is evoked for all of the following four responses: 1 Knowing the right answer; 2. Knowing that one knows is doubly rewarded. Inferably, well-founded confidence can be a major asset; 3. Guessing which is right, since over evolutionary time, being a knower or good guesser gives anyone who bears these skills a survival and mating advantage over those who lack them; 4) If, on the other hand, someone guess wrong then in a timely manner acquires the right answer, he or she will again be rewarded with pleasure for having learned something new and valuable. Rewards in the cognitive niche are infinite! So, which species below doesn't fit the family classification in the top row? All species in the column are closely related but the right answers are species not in either family. The outsider in column one is star anise. In the second column, the gibbon is the one that belongs to a distinct family: Gibbons are apes in the family Hylobatidae (see the diagram below). This is arresting, because for most people, gibbons and gorillas appear to be more closely related than humans and bonobos. Not so. While Homo sapiens and gibbons are Hatfield–McCoy, bonobos (pygmy chimps) and humans are kissing cousins. Anise and star anise are more like Hatfield-McCoy, whereas anise and cumin kissing cousins. In 99% of the recipes I visited online for this series anise and star anise were used interchangeably, along with the liqueurs created from either one. 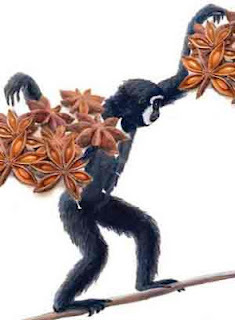 Star anise is as similar to anise as gibbons are to humans. Probably billions of years ago we all shared a common ancestor, but a lot has happened since then and much of that "lot" makes life make sense. Star anise is not a member of the family Apiaceae (parsley), and gibbons are not a member of the Hominidaea family. Humans and chimps are as closely related from a phylogenetic perspective as cumin and anise. Gibbons and star anise each belong to distinct categories.The point for this series of posts is that small differences, which may not be visually obvious, can be critical. Of course some differences in classifications can be attributed to the science of phylogeny, which is ever-evolving. The species considered part of one family this week may turn out with new evidence to be re-classified. For California Central Coast consumers of top quality seafood such as lobster and mussels, the ability to distinguish among fennel, anise, and star anise will increasingly prove especially important and demanding in the next decades. All three spices (fennel, anise and star anise) contain the chemical anethole, responsible for the licorice taste. Star anise (Illicium verum) comes from an evergreen tree, in a family more closely related to that of magnolias than to the parsley family. Note: small differences can result in hugely distinct outcomes, but also, look-alikes may actually be very different. Star anise is cheaper than aniseeed, which may be one explanation for how often one is substituted for the other. 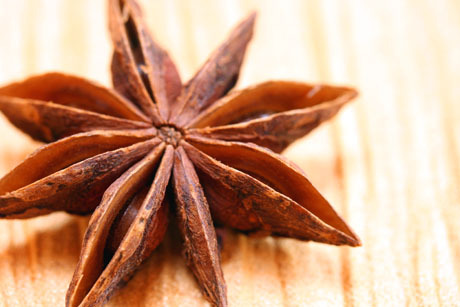 The star anise is the fruit, made up of eight woody pods joined in a star shape. Because of its woody character, the star anise typically flavors broths and sauces and is removed before eating. Each pod has one licorice-flavored seed. Both star anise and aniseed contain anethole, the chemical responsible for the licorice flavor found in anise, fennel, chervil, tarragon, star anise and anise basil. Star anise provides a more strident, slightly bitter flavor than does anise. Both are used in liqueurs and both are used with seafood, though star anise tends to flavor seafood with defining flavors, such as lobster or mussels. The oils that give star anise its characteristic complex aroma are anethole, providing the licorice element, safrole, adding a root-beer/nutmeg/sassafras note, terpineol, furnishing a resiny piney, smokey, lilac set of notes, and traces of the oil eucalyptol , adding a pleasant spicy camphor flavor. The net blend is strongly aromatic: warm, sweet, licorice, faintly lilac and a touch of pine. Remember, this fruit comes from an evergreen tree. Anise is a flowering plant in the parsley family native to the eastern Mediterranean, now grown there and throughout southeast Asia. The seed pods are the anise seeds, usually crushed to flavor broths and sauces. The licorice flavor is milder than imbued by star anise, so anise is typically applied as a complement spice rather than a defining characteristic of a dish. "The aroma of the essential oil (up to 3% in the fruits) is dominated by trans-anethole (max. 90%). Additional aroma components are estragol (iso-anethole, 2%), anise aldehyde (less than 1%), anise alcohol, p-methoxy-acetophenone, pinene, limonene, γ-himachalene (2%). An unusual compound is the phenol ester 4-methoxy-2-(1-propene-yl)-phenol-2-methyl-butyrate, which is characteristic for anise (5%)." Fennel is a root vegetable with the mildest licorice flavor of the three spices.Native to southern Europe and the Mediterranean region, fennel has been used for centuries as a spice, vegetable, and for medicinal purposes. While not native to the Americas, fennel has aggressively seeded in California for at least 120 years, where it now grows wild in most Mediterranean climates, such as found here in Santa Barbara, and notably in the Santa Cruz Islands. For culinary purposes, fennel is most often used in salads, as a roasted vegetable, or in bisques to add a subtle, mildly sweet licorice and faintly lemon-rind flavor derived from the limonene, see below. Fennel is also very commonly used as a complementary spice, much as coriander, but in this case, to flesh out and nuance a broth or sauce. As a vegetable, fennel offers the possibility of strategizing not only taste but texture. Katzer's spice page lists the following oils in fennel, some but not all found above in anise and star anise. "The essential oil of the most important fennel variety (var. dulce) contains anethole (50 to 80%), limonene (5%), fenchone (5%), estragole (methyl chavicol), safrole, α-pinene (0.5%), camphene, β-pinene, β-myrcene and p-cymene. In contrast, the un­cultivated form (var. vulgare) contains often more essential oil, but since it is charac­terized by the bitter fenchone (12 to 22%), it is of little value." Anise is used to flavor Middle Eastern arak, Colombian aguardiente, French spirits absinthe, anisette and pastis, Greek ouzo, Bulgarian mastika, German Jägermeister, Italian sambuca, Dutch Brokmöpke, Peruvian and Spanish anís, Mexican Xtabentún and Turkish rakı. The recipes below feature two seafoods considered by the two top raters (Monterey Bay Aquarium and Blue Ocean Institute)as either best choice (mussels) or relatively sustainable (lobster) (rated chartreuse for second to highest, meaning minor concerns but overall good ecological choices). Lobster and mussels, like the spices above, comprise multiple species. Since this blog favors locally sourced foods, the recipes feature our local spiny lobster and local farm-raised mussels. A post later this month will discuss the sustainability of different famed seafoods. Santa Barbara Mariculture cultivates the Mediterranean Mussel, Mytilus galloprovincialis. Local species include Mytllus edulls and Mytilus californianus, considered a promising species for aquaculture. The recipe below makes a good tapa/appetizer. Remove as much meat as possible from the lobsters, reserving the shells. Roughly chop the meat and set aside. Melt 1/4 cup of the butter in a large pot. Add the lobster shells and toast for 2 minutes. Add the onion, fennel, celery, shallots, garlic cloves, fennel seeds, saffron, and star anise. Sauté until the vegetables are soft, about 5 minutes. Add the brandy and Pernod, scraping up any bits from the bottom of the pot. Add the butter and tomato paste and cook for another 2 minutes. Add enough water to just cover the shells and simmer for 30 minutes. Remove from the heat, and add the tarragon and parsley. Let sit for 15 minutes. Remove the shells and star anise. Blend the sauce with an immersion blender and strain. Depending on how much water you used, you may want to bring the sauce to a boil and reduce it to a thick, drizzleable consistency. Heat 1 tablespoon of the olive oil over medium high heat. Sauté the lobster and artichoke hearts just until they are beginning to color, about 2 minutes. Remove from pan and set aside. Lower the heat and add the remaining olive oil and minced garlic. Cook the garlic slowly, stirring, until lightly golden. Add the pimentón and mix well. Return the lobster to the pan. Toss and let cook another minute. Add the parsley, cilantro, and lemon juice. Place some of the lobster and artichoke in the center of a plate. Spoon a small amount of the garlic and olive oil over the lobster and then a spoonful of the sauce on top of and around the lobster. 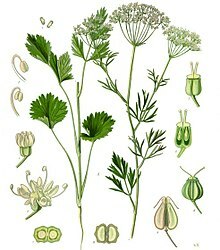 Next post and last of this series on the importance of small distinctions is on dill and caraway with mention of tarragon, anise basil, and chervil.